Pink is technically a pale red or a mix of red and white. It most often symbolizes femininity. Interestingly, in Japan, the color pink has a masculine association; the annual spring blooming of the pink-blossomed cherry trees (the Sakura) is said to represent the young Japanese Samurai who fell in battle in the prime of life. “Tickled pink” means to be happy. Except when you get fired, you get a pink slip. Pink can also symbolize drunkenness (pink elephants) and something not ready, like rare meat that is too pink. When someone is “In the Pink”, they’re in the full bloom of health, unless they have Pinkeye, which is a notoriously contagious condition. Interestingly, “In The Pink” never used to mean health and happiness as it does today. Charles Dickens used pink to denote “the very pink of hideousness and squalid misery” back in 1845. This one was done later in the Spot color series. I was inspired by some dramatic spring storm lighting down a corridor of cherry trees. It was an unusual lighting effect, both bright and dark at the same time. The horizon was bright but the clouds overhead were ominously dark. It was the same time of year as when the cherry trees are out in full bloom. On that day, the wind made angry confetti out of the petals. Vancouver’s cherry trees are exuberant; they make even the grittiest urban environments look bridal-pretty. 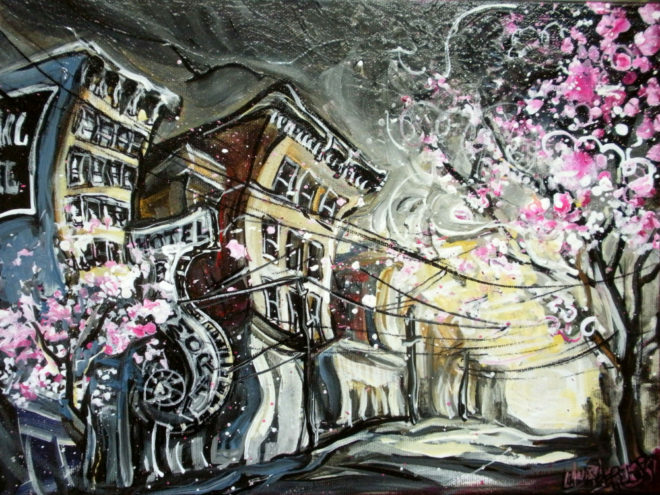 The Balmoral is a hundred-year old hotel in the downtown eastside. While gentrification is eroding the hard edges of one of Vancouver’s most troubled postal codes, police still make nightly visits to the Balmoral and consider it the worst slum hotel in the city. In the past year at the Balmoral, a large meth lab was discovered and dismantled, a musician died under suspicious circumstances, and there have been countless lives changed, usually not for the better. Seeing pink in the downtown eastside is an interesting contradiction, because most would say that this is the least innocent and healthy neighbourhood in Vancouver. It’s a more Dickensian place than a fairy-tale one. But even here, there can be pink.